First impressions count - if the outside doesn't look its best then buyers will assume the same about the inside. Sell or buy first? Having made the decision that you are moving, usually we would advise putting your property on the market before, or at the same time, as beginning your search for a new home. This will give you more credibility with other agents and sellers alike, as it shows to the market place that you are serious about moving. Any offers that you make will be taken seriously and if a figure can be agreed then your offer may be 'acceptable when you have sold'. 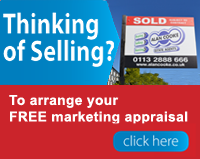 In effect you are expressing a strong interest in the property and 'marking your territory'. These factors outweigh any worries you may have of agreeing a sale on your home without having found a new one to buy. When marketing your home, we take great care in looking for the buyer individually suited to your needs and circumstances. We have buyers that can move quickly and others that are flexible and will give you some time to find your next property. Remember - If you are unable to find a new home then you simply do not move! Don't forget it is your home and nobody can make you move... you have complete control!